Before we get too deep into this, a quick story. A seasoned music teacher once had trouble getting the best out of his students. On a particularly frustrating day, the teacher waved down his class, thrashing his baton about impatiently. After a long pause, the instructor scanned the room, looking each member of the group right in the eyes. Consider, for a moment, the phenomenon in storytelling known as the Black Moment. The Black Moment is the point in the story where our main character is at her lowest. She has been beat down by Ultron, or her boyfriend has broken her heart and stranded her in Spain, or she’s just been fired from her job after discovering her sweet grandmother Judith has been robbing her trust fund for the last 25 years. It’s as if our hero says “Well, nothing worse than ______ could happen,” so they are inspired to take the actions required to fulfill a destiny. Black Moments happen in real life as well. Alex Hamilton loses his entire family, and becomes impervious to political obstacles. Pablo Picasso watches his sister die in front of his face, and no longer cares what people think of his painting. Oprah Winfrey suffered sexual assault as a child, and any rejection she receives in her career is becomes an insignificant speed bump. Frida Kahlo went through at least 4 Black Moments, the most grievous of which was the bus accident which left her lying in the street with a pole impaled through her lower half. “Tragic” is a good way to describe the 47 years Kahlo spent on this planet. “Devastating” is more accurate. But as with every meaningful life, beauty can be found in ashes. Hope, in suffering. Light, in darkness. Frida was nothing if not a light. If Frida did have an “advantage” in her career, it was the cumulative tragedies she went through. First — polio at age nine. Then — a bus wreck which left her impaled by a pole, covered in gold glitter, and lying on the street naked. Next — a tumultuous marriage, which would include multiple affairs (one with her sister). After that — two forced abortions and a miscarriages. Finally — the amputation of her right leg. All of this before her relatively early death at 47. Although she didn’t start painting “seriously” until later in life, Frida was able to create so much poignant work by virtue of the sheer quantity of disappointments life had offered her until that point. Pain IS life, as inseparable as a drop of water is from the ocean. We should not be so sadistic as to ask for tragedy in life. Instead, we should be asking to better express those tragedies through our work. The sentiment here is pure, I think — words borne of a desire to differentiate. After all, the baggage included in the word “creativity” includes an expectation of the completely different and new. (This is, of course, a complete fallacy, but more on that later). At least part of this quote can be applied to Kahlo. In a world where everyone was moving right, Frida took only left turns. In her childhood classroom, she was the one singing and dancing. In the subdued fashions of America, she sported wild and bold color. 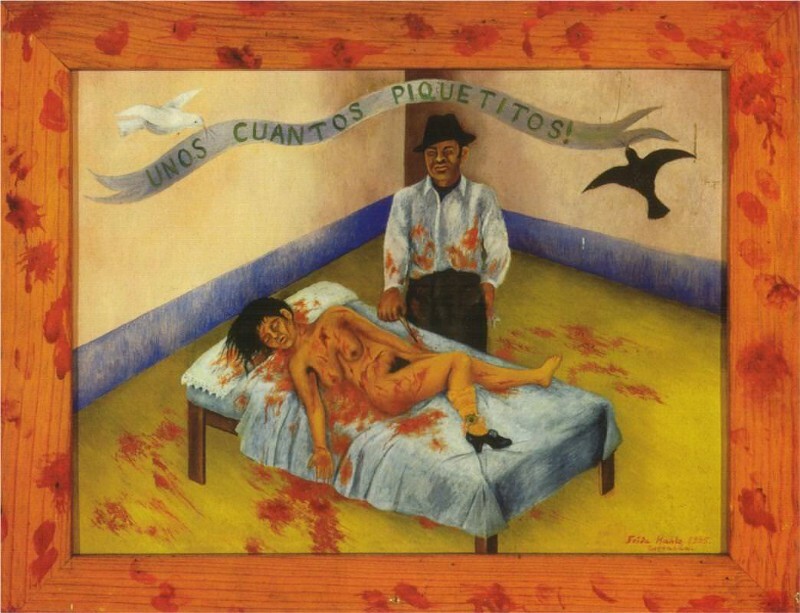 Frida had love affairs with men and women in a time where the latter could earn you scorn from the community. And when everyone else who could hold a brush was in the business of monstrous, grand murals, Frida’s work progressively got smaller. It’s important to point out she held her personal voice and style although she was married to Diego Rivera, one of the great muralists of the day. Consider the extraordinary strength of identity this requires. I am so malleable of mind at times that when I see a taco, I want a taco. When I read a great work of fiction, I want to write novels. Yet Frida would watch Diego paint enormous blocks of wall for hours and days at a time, and then go home and distill her own convictions into canvases the size of coffee table books. 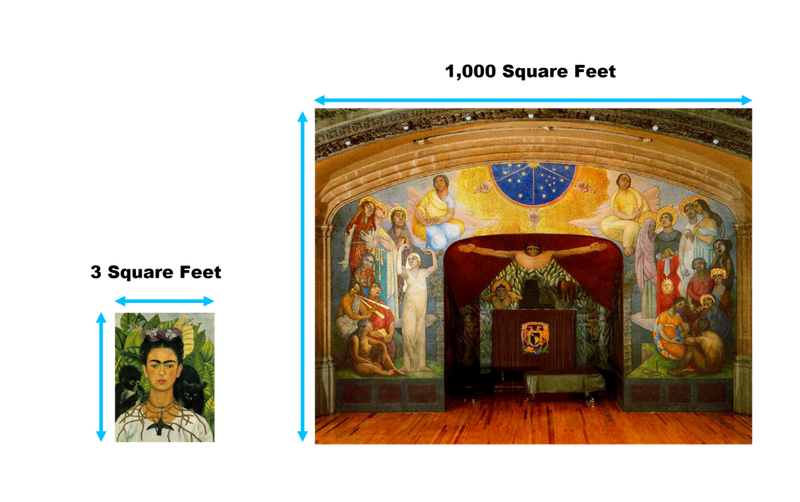 In one of Frida’s more well known paintings, The Two Fridas, the artist depicts two versions of herself sitting across from each other. Look at that. Completely original. New. Unique. 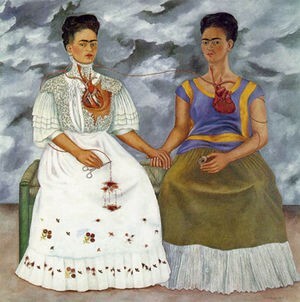 Kahlo saw this picture at the Louvre the very same year she created The Two Fridas. This is another reminder — originality has a cap. Many beginner artists think the best way to go about creating original work is refusing to accept influence from anyone, shutting out the world to attempt at something completely unique and true. Instead, the opposite is true. The great artist must observe and consume as much as possible, allowing herself to be malleable to the styles, the choices, the compositions, the ideas, and the philosophies of old masters now gone. Practically, the concept is simple — take an idea which has been proven to work. Then make it your own. Though her marriage to Diego was… well, a disaster, it did not come without its benefits. Diego was well connected and well respected in the artist’s community. This meant that once he and Frida left Mexico, her social network would have been flooded creative professionals. His work took him all over the work, including what could have been called the capital of art at the time — Paris. At its core, creativity is nothing more than combining existing elements to produce new and interesting solutions. Most of the time, too much emphasis is placed on the output of art, and not enough on the input. 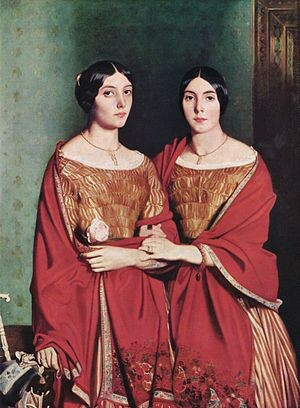 Even though she had not started painting consistently, Frida would have seen as much art as anyone else on the planet. Today, we are so exposed it is taken for granted. Want to see the Mona Lisa? Done. Curious about Monet’s Water Lillies? No need to plan a big trip. Today, humanity’s entire art history is within 2 seconds of your searching. Frida had this education 60 years before everyone else. But there is a clear difference between information and instruction. 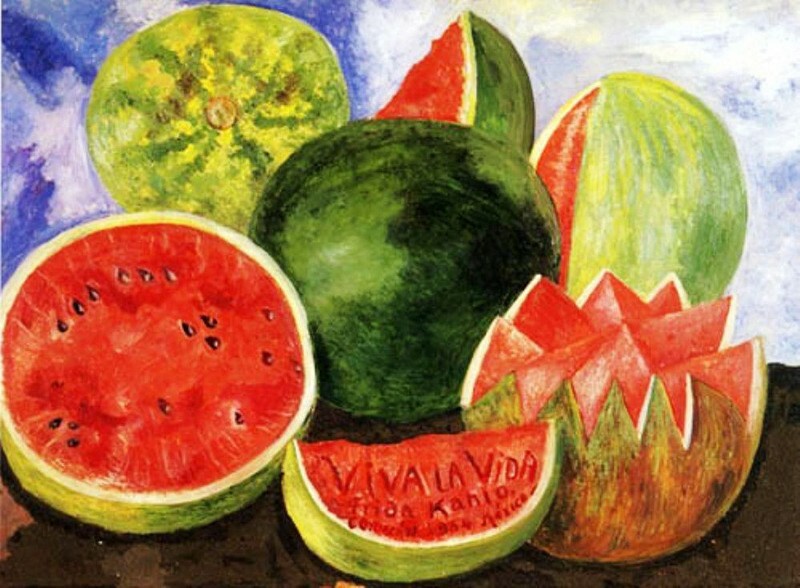 Frida also would have been granted access to the mind of the modern artist. She knew how they thought. She knew how they dreamed. She knew how the went from Point A (blank canvas) to Point B (finished masterpiece). By the time her Muse began shouting at her, she was equipped with the technical skills as well as the mindset to make a big difference.